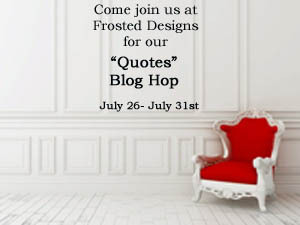 Frosted Designs Quote Blog Hop Winners! It was nice to see all of entries for our Quote Blop Hop. We know that this time of the year is busy for everyone and we're glad you had some time to join us. We would like to thank our sponsors Artful Delight and Molossi. Please email Debbie at frosteddesigns@ymail.com with your mailing information. Please put Blog Hop Winner in your subject line. You have seven days to claim your prize. Don't forget to check the Design Team member's blogs that participated in our blog hop, as some of them are giving away blog candy. Good luck to all!